Thomas Alva Edison was born in Milan, Ohio, February 11, 1847. Edison had almost always been interested in science. After he had received an elementary physical science book from his mother at the age of 10, he set up his own small chemical laboratory. In which he soon operated his own homemade telegraph set. At the age of twenty one he became a night operator for Western Union Telegraph in Boston. When he was not working or sleeping he was studying electrical currents. In 1868 he completely gave up his job to become a freelance inventor. Edison�s first patent was for a vote recorder. By 1869 Edison was sleeping in a basement under Wall Street when a telegraphic gold-price indicator broke down. Edison repaired it with such expertise that the company that owned the price indicator hired Edison as a supervisor. They also commissioned him to improve the stock ticker coming in to use then. The outcome was Edison�s Universal Stock Printer which brought him a fortune of $40,000. With the money he set himself up as a manufacturer of Stock Tickers and High Speed printing telegraphs in Newark, New Jersey. 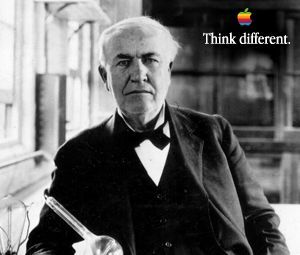 In 1876 at the age of 29 Edison gave up the factory and moved to Menlo Park, New Jersey, where he set up a laboratory. Soon he was working on 40 different projects and was applying for almost 400 patents a year. In the end Edison had over a thousand patents including the electric lamp and the alkaline storage battery. Thomas Edison died October 18, 1931.